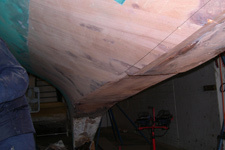 Shaula was designed by Sparkman & Stephens and built in 1965 by Wilfred Souter in Cowes. 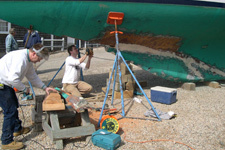 She has been maintained by Concordia since 1978. 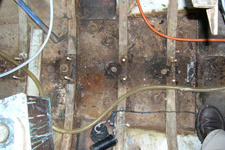 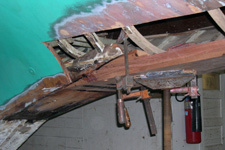 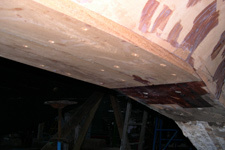 Inspection and subsequent survey in the winter 2005-2006 found the forward section of wood keel rotted and in need of replacement. 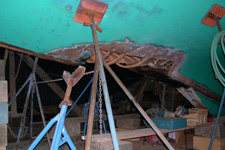 The aft section was replaced by Concordia in 1981. 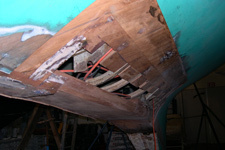 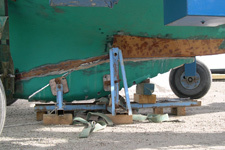 We removed the ballast, cut back the hull and removed the keel, built a new keel, installed the keel, replaced the sections of cold molded planking, reinstalled the ballast and rebuilt the deadwood. 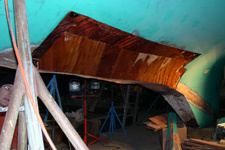 Concordia carpenters, Scott Rudolph and Rich Emory, working on Shaula.